Lots of churches use the My Rotas functionality that enables rota members to organise and process their own swaps in My ChurchSuite when they can't make their serving commitment for any reason. 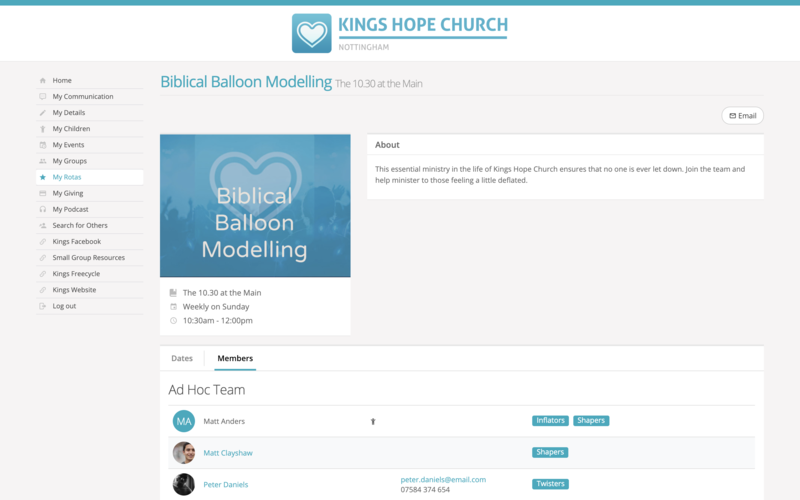 It's a great feature to encourage team members to take some appropriate responsibility for arranging cover and updating the rota, rather than bouncing it back to the church office or ministry overseer to resolve. However, we recognise that some churches prefer to mange all rota changes in the office and don't want to allow rota swapping. Here's how to enable or disable the rota swap functionality for My ChurchSuite. This article assumes that the My Rotas section of My ChurchSuite is enabled, and that your rotas are published and therefore visible to rota members in My Rotas. Go to the Rotas module options - accessed via the cog-wheels icon in the top right-hand corner of the module. To access this feature you will need Manage module or Administrator permissions. 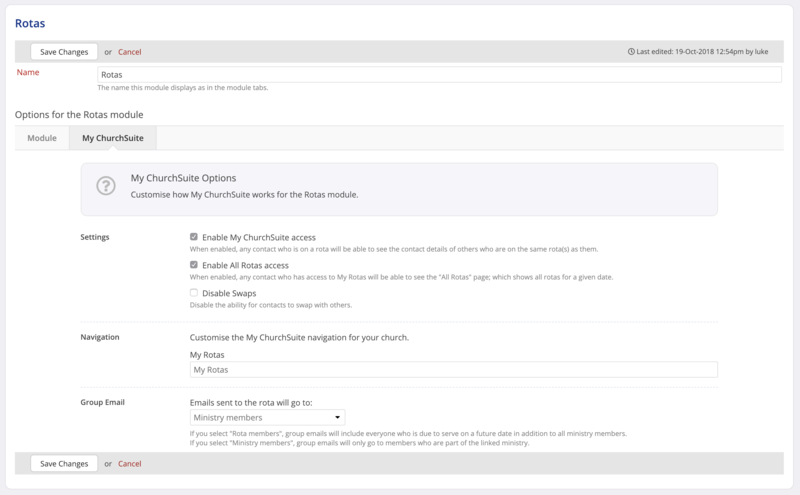 Within the module settings, select the My ChurchSuite Options tab. Here, in the Settings section you can tick to Disable Swaps, or un-tick to enable swap functionality. Disabling swaps will prevent rota members from being able to process a swap in My ChurchSuite. Designated ministry overseers are of course still able to manage the rotas they oversee, including processing swap changes. How does the My ChurchSuite swap functionality work? Different churches will have their own preferred internal processes that they wish their serving rota members to follow; but essentially the ChurchSuite swap functionality works on a trust basis - it's not intended to be used as a mechanism to "inflict" a swap on someone unsuspecting! - and neither is it an 'approvals' system where an overseer or another team member "accepts" or "declines" a swap request. First, rota team members are able to view the Members list for their rota in My ChurchSuite. 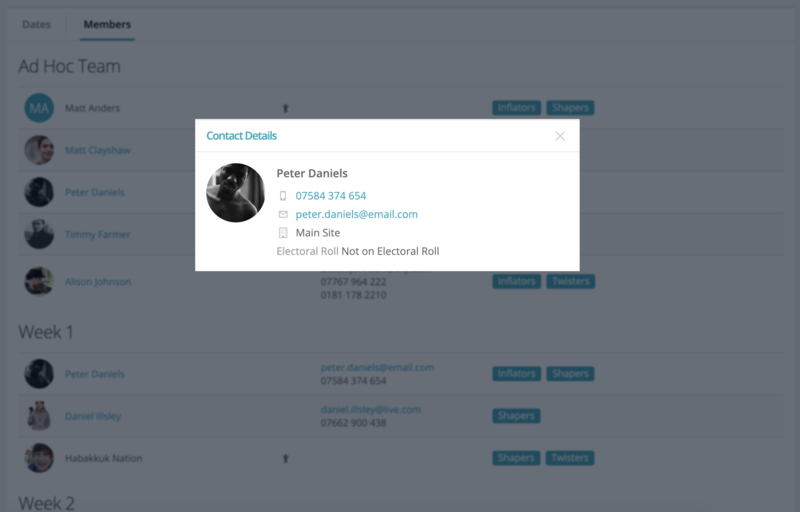 Clicking on any rota member will display a popup of their contact details (subject to that person's privacy settings). Rota members will only be listed if their privacy settings have Name is visible enabled. Rotas members can then use this contact information to reach out to other people, perhaps based on appropriate roles, to relationally agree a swap. A further option is to use the Email button (top right corner of the rota) to send a rota group email to everyone on that rota enquiring if someone is available to swap. Note that a group email is sent to the whole rota - it's not currently possible to further filter by role. Again, rotas members can use this method of communication to reach out to others on the rota to relationally enquire is someone is able to swap - the swappee will inherit the swapper's roles, and vice versa. When a rota member is viewing a rota in My ChurchSuite, for each rota date they are set to serve, there is a member menu button next to their name - designated by the circle icon with three dots within it - see the example below for Paul Nation. From this menu, the rota member can Organise swap and Add unavailability. Click Organise swap. The Organise swap page is opened. Select the Swap with name of the person you are swapping with - only available rota members will be listed. The Return swap menu will show a list that person's future serving dates for all rotas related t the ministry. In this way, rota members can swap across different services and rotas derived from the same underlying ministry. Click Save Changes and the swap is processed. If there are any clash notifications detected with the swap being processed, a message will be displayed. For example, you cannot swap with a person who is already on the rota for the date your are swapping, even if their roles are different - rota swap is not role swap! Similarly, if the rota swap causes a clash - perhaps because that person is already serving on another rota at the same time, the swap will not be processed - swap processing cannot be used to cause other rota issues - on ministry overseers can process swaps that results in clashes, as only overseers can override the clash detection. Once a swap (and optional return swap) have been successfully processed, an email notification is sent to the swapper, any return swappee, and the ministry overseer(s). Rota members can only process their own swaps, unless a return swap is being made, in which case the return swapper can process the swap. Ministry overseers can process any swap. Rota members cannot process a swap that will cause a rota clash. Rota members can only swap with available rota members who are not already serving on the date being swapped. The swappee inherits the role(s) of the swapper, and vice versa where a return swap is made. Rotas members cannot swap or change their roles - only a ministry overseer can make role changes. Swap confirmation emails are always sent to all parties - the swapper, the swappee and the ministry overseers. Rota swaps can only be processed or returned for future dates on a rota.